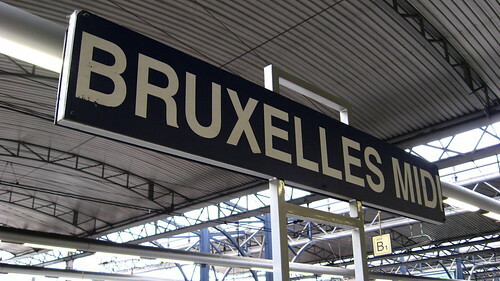 In my Europe, I will be living in Brussels in one week. Belgium will be the fifth European country in five years that I am living in, but I don't feel like I am going "abroad". I am going away from where I am now, and it will be different from where I have been in the past. But that is not important, this is life in Europe. In fact, I move to Brussels as a political scientist, as somebody who is trying to understand social and political regularities of a system called "European Union". These regularities may not even be specific to the EU, but I am interested in studying them for this particular case, a supranational political system. This is actually the first time I will live in Belgium and in Brussels, and it is the first time that I will try to take a look at EU politics from inside "the bubble" (except for my short visit last October). I'm intrigued by the change of perspective, although I still hope that I can keep the view of an outsider while trying to adapt to the living conditions of a new city and a new country. I'm not sure what this will do with my blogging, because I've always been euroblogging from an outsider perspective. But as I have said above: I come as a political scientist, not as a blogger. Blogging will move with me, but that is because it is part of my European citizenship, not my profession. There is no need to be in Brussels to euroblog, to the contrary, it might even be better not to be there. What I know is that as a political scientist I want to meet as many people working in and around the EU institutions as possible and talk about their work, their thoughts, see how they interact and how this makes them part of EU decision-making. So if you'd like to meet me as political scientist or as a (blogging) European citizen, don't hesitate to contact me, I'm interested in a lot of topics and perspectives related to EU politics or life and work in the EU "capital". Until then, I wish you a Happy Europe Day 2010, a happy 60th anniversary of the Schuman Declaration - and see you around, whether in Brussels or elsewhere in our Europe! Well Brussels in actually a Europe but in smaller. It is amazing how everyone can feel at home there. Even people that never really lived elsewhere than their homecountry. You may heard already about the Open Beer meetings? Be sure w'll organise one soon after your arrival! In that way you can meet as many of us in the "Brussels bubble" as is possible in a short time. Julien, it will be very good to see you again in Brussels. It's a great city to live in. Julien, I am in Brussels for a two months PhD research period at Egmont Institute. We can try and set something.